I am not sure why I feel like I need to complete a gazillion projects before I leave on vacation, but it happens every single time. The week before we left my mind was whirling with ideas and projects I needed to finish right then. Unfortunately, there are also things you have to do to prepare for a trip like laundry and pack. I did finish a couple of things for myself before we left. I had to have a new purse of course. I saw this bag over at Noodlehead and decided it looked perfect. It took me about 2 hours over the course of two evenings to finish. I used flannel between the two layers instead of interfacing. Since my mind was reeling the week before vacation, I was doing a lot of doodling in my notebook I carry around with me. I find it is the easiest way to keep track of my ideas. The notebook has been pretty abused in my purse, so I decided to get a larger notebook and make a cover for it. 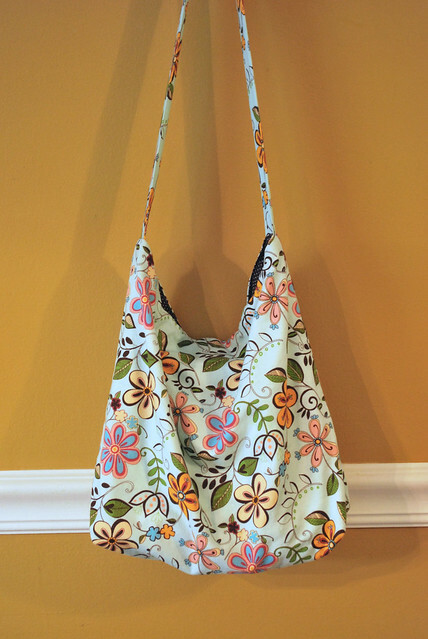 I wanted it to be a larger, simplified version of my Zippy Art Purse. 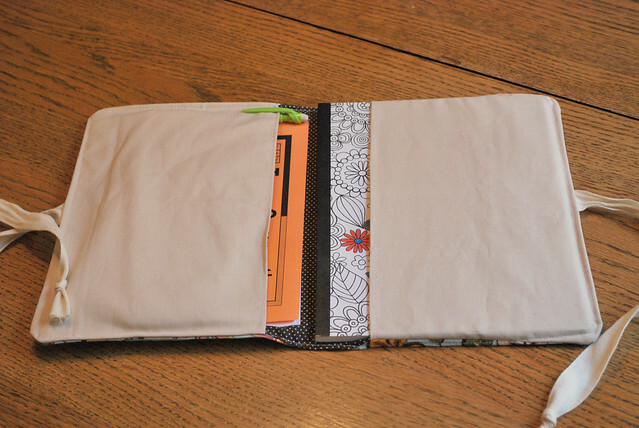 I made it large enough to fit a composition notebook. I put pockets on each side instead of including a zipper pocket. I also used twill tape to tie it shut and omitted the straps. Instead of using interfacing, I used a piece of flannel between the layers. With these changes, I had the cover made in about 30 minutes. I plan on making another one for a birthday gift, so I will write down the measurements in case anyone wants to make one. I have a couple of wholesale orders to work on this week. I am really struggling with these. I am getting to the point where I want to sew what I want to sew when I want to sew it. I don't want to sound ungrateful for the business that I have because I am not. It's just that my sewing time is so limited. 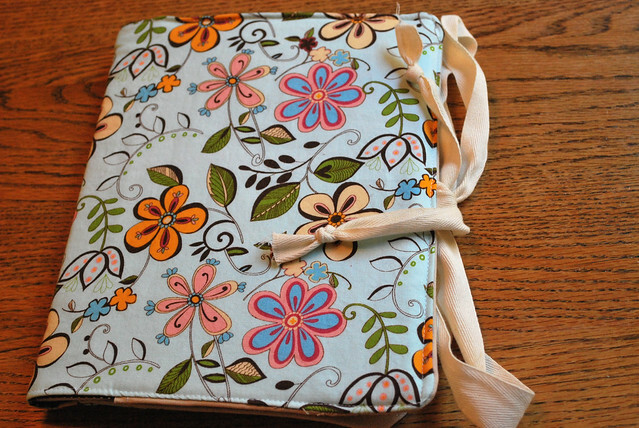 When I get a chance to sew, I want it to be a creative outlet not just another chore that has to be completed. I had a lot of time to think about things during our vacation. When you spend that much quality time with your family, it really puts it all in perspective. You know? I am feeling like I need to reprioritize some things in my life. I am not completely ready to call it quits, but I am seriously considering it. I might keep the Etsy shop up for random things, but end the wholesale and custom orders. I do have a ton of materials that I have collected so I still have some decisions to make. On a completely unrelated note, today is my mom's birthday. Happy Birthday Mom. I love you and hope you have the best birthday ever. Personally I like the middle of page owl on the left side. I think they would make good sticky note pads as Christmas gifts. LOVE, love that fabric! It is so great and the bag is adorable. I would LOVE the measurements if you ever get a chance...that would make some great grown-up gifts. But totally understand in not having a free moment to even write them up! Plus you guys are trying to get back into the swing of things after what looks like a great vacation! I can understand feeling pulled in two directions with the business. It's hard to keep things balanced, and succss is both a blessing and a curse! I always love the stuff you make...you find the best fabrics!